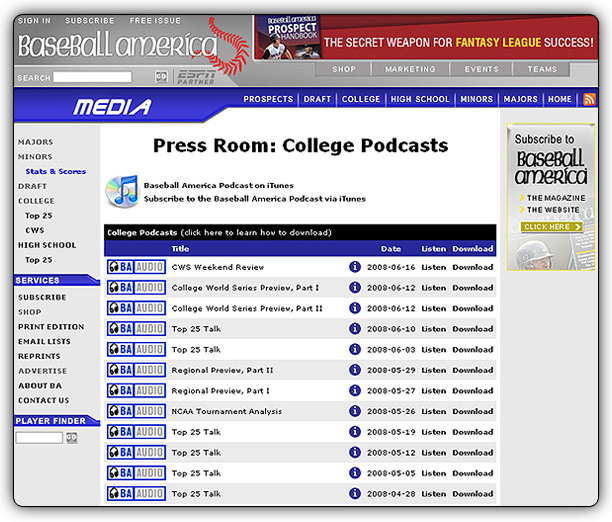 BaseballAmerica.com is an extensive site focusing on amateur, high school, college, and minor league baseball with over a million hits a day. Baseball America turned to IONA design to build the e-commerce portion of their website. IONA and Baseball America worked together to create several different revenue generating mechanisms including their online store, banner management system, automated prospects plus (an online subscription service), and most recently, the transition to a subscription based site architecture. To develop the custom application that fit the specific needs of the Baseball America community, IONA focused on evaluating the target audience and the way the users work within the community. Typically, community administrators have purchased off-the-shelf community software to provide an online presence leaving administrators to fit community members into an in-flexable infrastructure of software. IONA made it a priority of removing this limitation of existing community architectures and delivered a new level of community building. Community Building is not only a software issue, it requires detailed planning, implementation and monitoring every step of the way. IONA combines intelligent application development, marketing strategy and skilled project management to offer a complete solution that goes beyond the typical ‘discussion board’ solution. Considering that baseball has always been considered the ‘All America Sport’, it is of no surprise that Baseball America, a publications that has stood the test of times was able to make its debut into the digital world over 15 years ago with flying success. IONA offered the support necessary for Baseball America to grow and grow in its digital presence. With its success of thousands of subscribers and a online viewership of minor-league baseball in the spring that compares with some of the highest viewership online, it is of no surprise that Baseball America found great success. 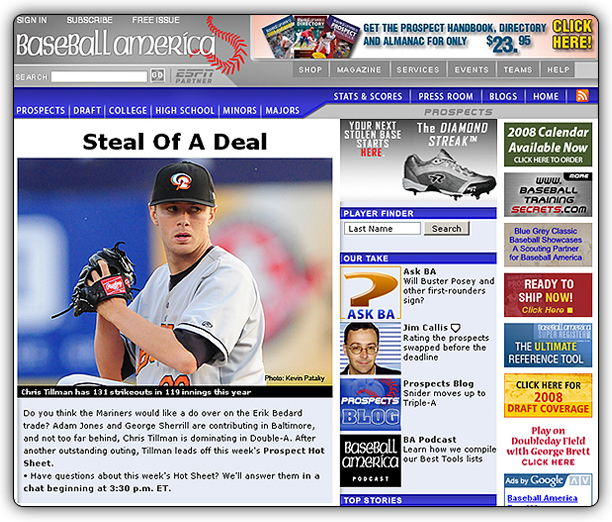 In turn, Baseball America was bought by one of the largest online publication companies online in 2005.